With Earth Day just around the corner, Horton’s would like to continue our Going-Green initiative by sharing “5 Going Green Lighting Tips”. These light bulbs seem to be known for their odd swirl like shape rather than their benefit to mother nature. However, CFL bulbs use only a quarter of the energy that normal incandescent bulbs use to light your home. 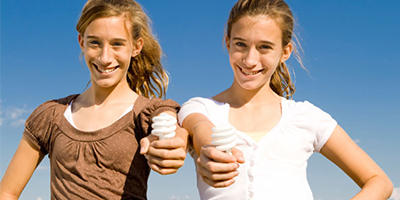 CFL light bulbs may cost a little bit more but CFLs typically last 10,000 hours longer than your standard bulb. LED lights or light emitting diodes, are becoming more popular by the year. LED lighting is the most efficient form of lighting for your home or vehicle. According to Design Recycle Inc. a single incandescent light bulb with a life span of 1,200 hours uses 60 Watts of power to produce light. While a simple LED bulb will produce 50,000 hours of light with only emitting 6-8 watts of energy. Hortons Home Lighting offers eco-friendly lamps and light fixtures to use throughout your home. Consider doing your part by filling your home with recycled furniture, lampshades, and other home materials. During your next visit to Hortons keep your eye out for recycled or reused materials to do your part. One of the most efficient ways to limit your lighting use is by starting good habits. Turning off lights when there is no use for them and when you leave a room are both great habits to consider. Another good habit would be to unplug your electronics. Believe it or not your electronics like your television, desk lamps and computers are consuming energy when they are on standby or off. If they are not in use reduce your electrical bill and your carbon footprint by unplugging all unused or untouched electronics. Open up blinds or walk outside and use the natural light as much as possible. This reusable energy source is the greenest energy source available and you won’t have to pay a dime!